In Wake of Quake, How Ready is Los Angeles? In wake of Italy quake, how ready is Los Angeles? 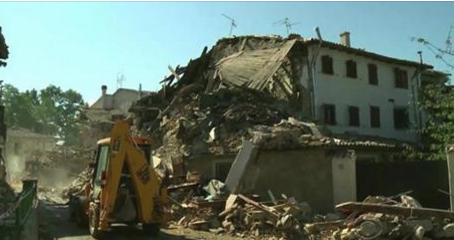 CBS NEWS, LOS ANGELES – The centuries-old villages pulverized in the Italy quake are far from the Los Angeles skyline, both in distance and constructions style. But Cal Tech seismologist Lucy Jones warns the destruction from a shallow earthquake centered here would look very similar, reports CBS News correspondent Carter Evans. “We have buildings all over the state that are 100 years old – there was no seismic information whatsoever used in building those buildings. So, unless they’ve been retrofitted, they are just as vulnerable as the buildings in Italy,” Jones said. Brick buildings crumbled in downtown Napa when a 6.0-magnitude quake struck in 2014, but damage was limited because many had already been strengthened. Pointing to an old brick building, Evans asked Jones what would happen to it in a large earthquake if it isn’t reinforced. “Well, so-called unreinforced masonry buildings like that, without any seismic strengthening, [are] essentially what I call a ‘death box,’” Jones said. Kit Miyamoto is a California seismic safety commissioner and a structural engineer. His company strengthens buildings in downtown L.A. and warns that anything built before the 1980s “could be really dangerous,” if not reinforced. The city of Los Angeles alone has identified 13,500 small residential apartment buildings that need strengthening, which can cost tens of thousands of dollars each. But Miyamoto says owners can start small. “You don’t have to fix everything, you don’t have to be perfect about it,” Miyamoto said, noting that every little thing done to reinforce a structure will make a difference. Experts say even many of the newer buildings in California are only earthquake “resistant,” meaning they’re designed to allow people to get out alive, but may still be uninhabitable afterward.